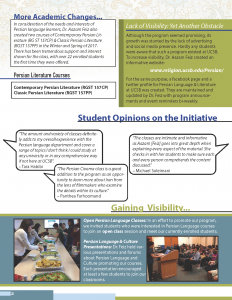 Department of Religious Studies offers courses in Modern Persian language (Farsi), as well as language courses related to the Iranian Plateau such as Turkish, Arabic, Aramaic, Syriac, and occasionally, Pashto and Kurdish. The Department of Religious Studies also offers a series of courses on modern Iran covering the period from the sixteenth century to today. 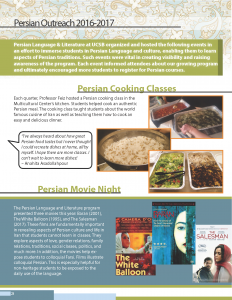 Department of Religious Studies and the Department of Global Studies offer courses in Iranian cinema. Department of Sociology offers courses on the sociology of the Middle East and Iran. 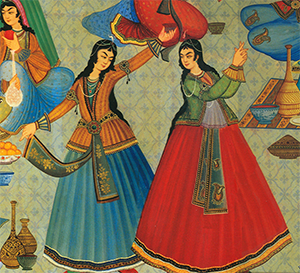 Department of Ethnomusicology offers courses in Persian and Iranian Music. Departments of Religious Studies, Feminist Studies, History, and Comparative Literature offer courses in Gender and Sexuality Studies related to the Middle East and Iran. 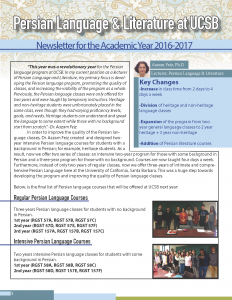 Requirements for the Minor in Iranian Studies are available on the General Catalog page. 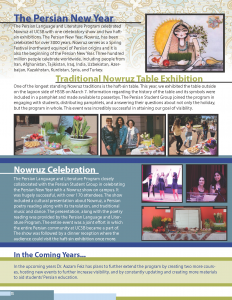 For more information about the minor, please contact Dr. Janet Afary (afary@religion.ucsb.edu). 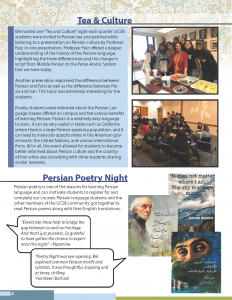 The Iranian Studies Initiative (ISI) is a resource center devoted to the research, teaching, and dissemination of Iranian and Persian language, history and culture. It is not an academic department and does not offer academic degrees. The Iranian Studies Initiative (ISI) was established in 2010 with support form the Duncan and Suzanne Mellichamp Endowment in Global Religion and Modernity in collaboration with the Department of Religious Studies and the Center for Middle East Studies. The Iranian Studies organizes annual lectures, symposia, film presentations and occasional conferences. In collaboration with the Middle East Ensemble in the Department of Music at UC Santa Barbara.